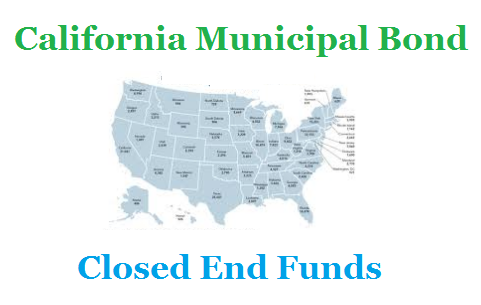 If you look for tax free income, you need to consider top California municipal bond closed end funds 2014. These CA muni bond funds provide high yield income for investors. Municipal bond funds are popular among investors who pay high income tax. As one of the highest tax income state in U.S, California residents can reduce their income tax by investing in CA municipal bond funds. These CA municipal bond funds invest mainly in California municipal debts. The income from these bond funds is generally free from federal taxes and California state taxes. For California residents, these investment funds are very attractive. Typically, the bonds have long average duration of more than 7 years. Investing in closed end funds can enhance your income as well due to its higher yield and leverage usage. These top closed end funds list is selected based on its year to date return in 2014. For details about the closed end fund screener, you can find the below table. Some of these top highest yield CEFs are among the best closed end funds. 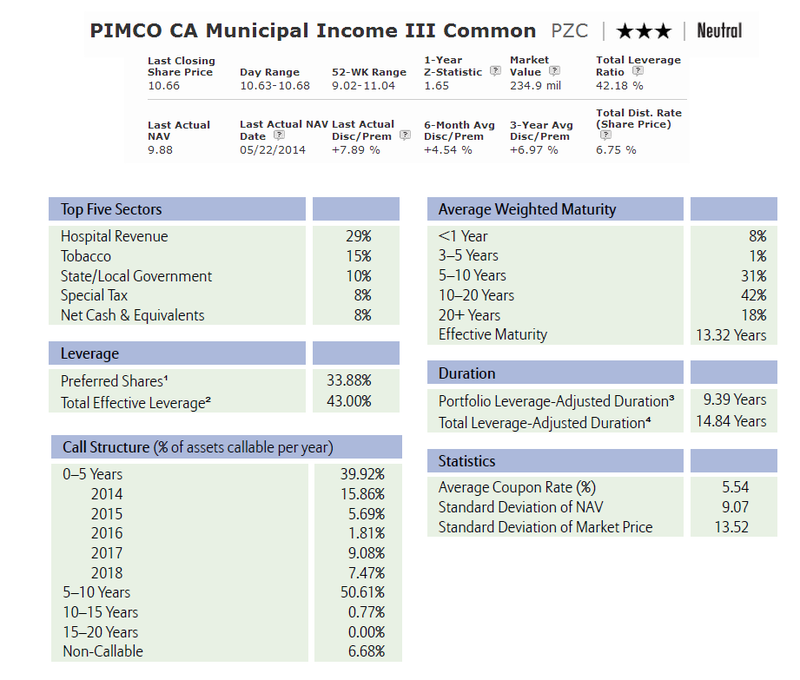 The investment objective of this PIMCO CA Municipal Income III Fund is to provide current income exempt from federal and California income tax. The fund’s CUSIP is 72201C109. The market value of the PZC is $234.9 million. It has 3-stars and Neutral rating from Morningstar. This California muni bond fund was incepted in October 2002. Joe Deane is the current fund manager of this PZC fund. It is currently traded at premium 7.89% from its NAV. The YTD return is 19.59%. This top CA muni bond closed end fund has 3-year annualized return of 13.23% and 10-year annualized return of 5.41%. Last year, 2013, it returned in -12.21%. It has total leverage ratio of 42.18%. As of April 2014, the top sectors are Hospital Revenue (29.0%), Tobacco (15.0%) and State/ Local Government (10.0%). It has effective maturity of 13.26 years. 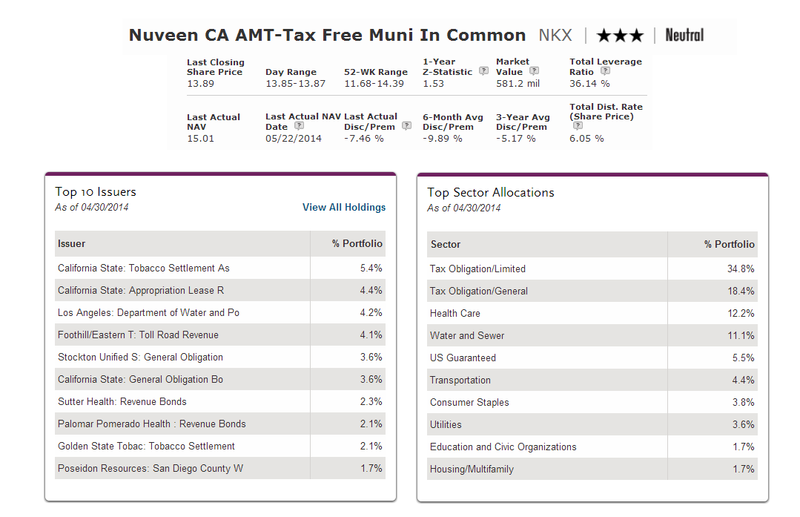 As one of the best California Muni mutual funds, this NKX fund is currently traded at $13.85. It has $581.2 million of market value. The distribution rate is 6.05%. It also has annual expense ratio of 1.05%. As of April 2014, the top 2 issuers are Tobacco Settlement As (5.4%) and Appropriation Lease R (4.4%). Tax Obligation/ Limited (34.8%) is the top sector allocation. Craig R. Brandon has just managed this Eaton Vance CA Municipal Bond Fund starting this year, 2014. The investment of this fund seeks to provide current income exempt from federal income tax, including alternative minimum tax (AMT), and California personal income tax. The market value is $252.2 million. It has total leverage ratio is 40.16%. This top EVM Fund has 16.26% YTD return. The fund has 5.62% of 10-year annualized return. The highest return within the last 10 years was in 2009 with 53.34% and the lowest in 2008 with -37.46%. 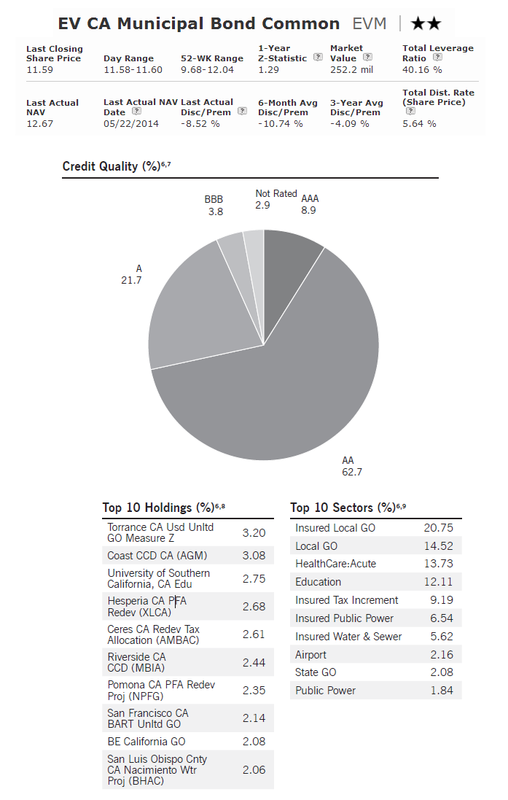 The top 3 bonds in its holdings as of April 2014 are Torrance Unified School District (3.09%), Coast Community College District (2.97%) and University of Southern California (2.65%).